February 4, 2019 -- Which U.S. states have the most and fewest dentists per capita? 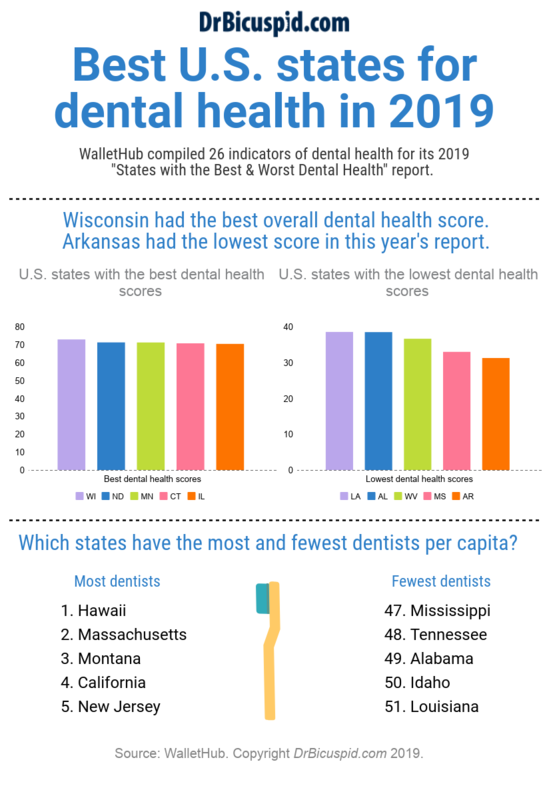 Which states have the best and worst overall dental health? A January 31 report from a personal finance website offers its annual look at the state of oral healthcare in the U.S.
WalletHub compared 26 key indicators of dental wellness across all 50 U.S. states and the District of Columbia. Wisconsin was ranked as the state with the best overall dental health, while last year's top state, Minnesota, was third in this year's report. Arkansas was the state with the lowest score, replacing Mississippi, which moved up one spot in the rankings. WalletHub used 26 different datasets to come to its conclusions, along with adding the insights of an expert panel of dentists, hygienists, and researchers. Hawaii has the highest concentration of dentists per capita with 49 dentists per 100,000 residents. If you are looking for a place to practice, Louisiana has the fewest dentists per capita, at 16 per 100,000 residents. For more information, the full report is available on the WalletHub website.